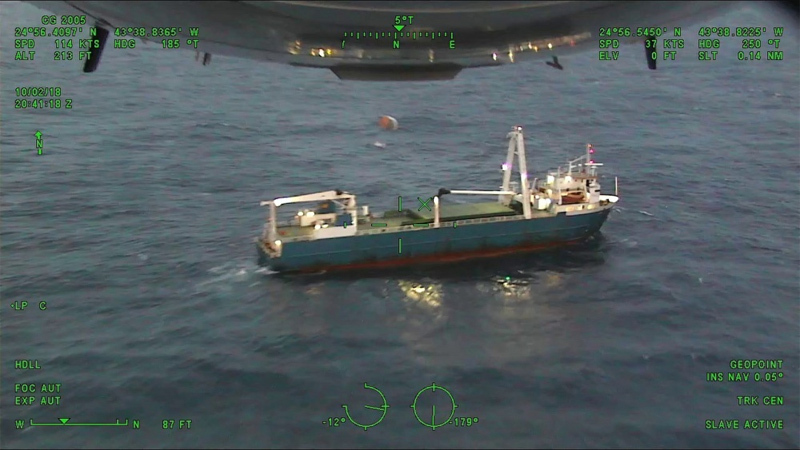 Local officials continues to assist the US Coast Guard with handling the 250ft cargo ship Alta, which has been adrift since last month, located some 1300 miles southeast of Bermuda with 10 crew on board. Supplies were reportedly running low, and a Coast Guard aircraft arrived into Bermuda last week to refuel before making a food drop to the vessel. A decision has been made for the crew to abandon the vessel, with the initial intention for survivors to be repatriated via Bermuda, but now bound for Puerto Rico. A Bermuda Maritime Operations Centre spokesperson said, “RCC Bermuda continues to assist the USCG Coastguard with an incident involving the 250ft Tanzanian-flagged cargo ship ALTA, on passage from Greece to Haiti, reported adrift [19th September] 1300 miles southeast of Bermuda, with 10 crew on-board. “Earlier attempts by vessel owners to dispatch tugs from Venezuela, Guyana, and Bahamas have proved unsuccessful and supplies on-board reportedly running low. A USCG C-130 aircraft arrived into Bermuda on Tuesday 2nd October to refuel before making a food drop to vessel a few hours later. “USCG Cutter Confidence arrived on scene Monday 8th Oct offering assistance to ship’s crew as negotiations for tug assistance ashore continued. “With the onset of TS Leslie and damage to vessel main engine, a decision was made for all crew [Panamanian, Honduran & Greek nationals] to abandon vessel. Dunn look disabled to me. Big Money op for local salvage personnel. It’s adrift in International waters with nobody on board. What cargo does it have and deisel and oil are premiun money…you could lease a salvage gug ,unload the booty and since k it for diving wreck. The big deisel and gen unit could supply electricity to airport and bridges and roadway lighting. hahahah and who will train them? Just work for belco if you want to learn. Just love all the armchair salvors. Nobody has a clue of the age of the vessel or if it is even worth repairing never mind the tens of thousands it would cost to get it to Bermuda where we can’t even keep our own tugs in operating condition good enough to go do a recovery job. a person engaged in salvage of a ship or items lost at sea.